LG released a cool sporty phone with beautiful user interface using Adobe Mobile Client “a flash lite technology, especially used for User interface and only available for an OEM or targeting BREW MP. The user interface is very intuitive that users will want to explore and master all of the functions and features of the LG-KP500. The UI allows users to access menus easily and shift around other menus simply and quickly with just one touch. Via Carlos, LG released Adobe Flash Lite Developer Guides for LG Phones. 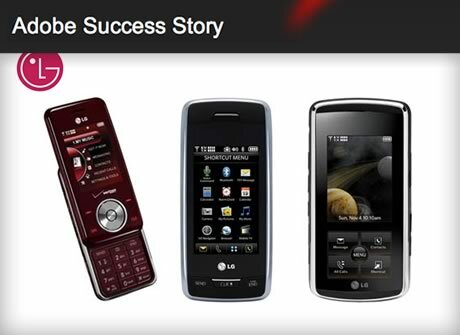 Via Bill, Adobe published about LG Electronics and the success they’ve had by using Flash Lite for the UI of their phones, including touch screen phones such as the PRADA. Creating smart and usable UI for mobile devices with emotional appeal is a designers big challenge 🙂 but design always passionate me to create something different. 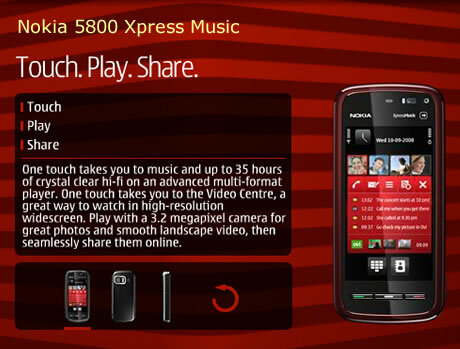 Finally something must to be excited about for Flash lite developer, Nokia released new Device API support for Nokia S60 5th Edition where it can access to Phone features. Developers of Flash Lite from Adobe applications benefit from the UI enhancements in S60 5th Edition, with more screen real estate and touch interaction enabling users to more easily and intuitively navigate Flash Lite content and applications. The on-screen keyboard also is available for text and data entry. S60 5th Edition continues to support Flash Lite 3.0, with the addition of ActionScript extensions to take advantage of S60 Platform Services. These new APIs enable Flash Lite developers to access device-application data, such as that held in Calendar and Contacts, as well as information on a device’s location. Together, the UI- and platform-access enhancements enable Flash Lite developers to create a completely new breed of context-aware applications and services that provide users with information unique to their own experiences.